More than 500 members of the campus and local communities joined UC San Diego Chancellor Pradeep K. Khosla, Executive Vice Chancellor Suresh Subramani and University Librarian Brian Schottlaender in celebrating the grand opening of Audrey’s, the long-awaited Geisel Library café, named for library benefactor and longtime friend and supporter of the university Audrey Geisel. Although the café’s namesake — also known as “Mrs. Seuss” — was not able to participate in the public ceremony, reports from Schottlaender and the crowd that day made it clear that the café passed muster, with flying colors. 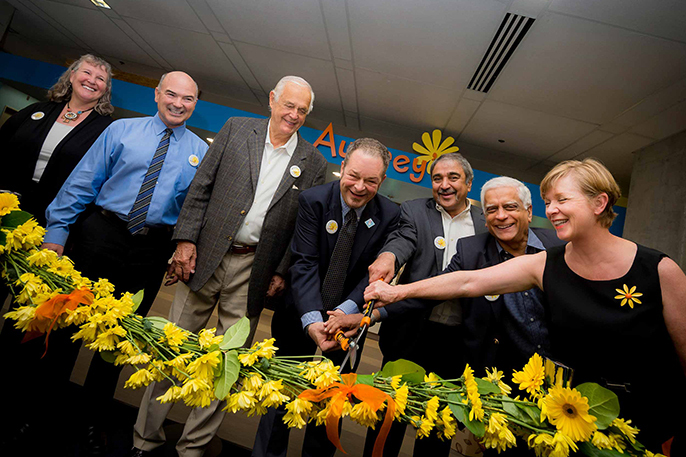 The campus celebration kicked off with a welcome from Schottlaender and remarks from Chancellor Khosla, followed by a Seuss-inspired “ribbon cutting” event, in which the two bisected a handmade, 16-foot chain of daisies with a pair of over-sized orange garden shears. Daisies, in shades of yellow and orange, were plentiful at the festive event, reflecting the Audrey’s logo and color palette — the bold shades of yellow, orange, and blue — depicted in the Read, Write, Think, Dream Stuart Collection installation, created by artist John Baldessari at the entrance to Geisel Library. “Audrey’s most recent gift to the Library made this great café possible,” said Chancellor Khosla. “It will help to rejuvenate heavily used public spaces on the main floor, add a new physical space for the Teaching & Learning Commons, and upgrade the marvelous 8th floor space. All of these enhancements will benefit our students." Also on hand at the ceremony were Alex Butterfield, Audrey Geisel’s longtime companion; Don Chadwick, director of Sports Facilities; and Associated Students (AS) President Dominick Suvonnasupa, and his newly elected successor, Daniel Juarez. Award-winning independent roaster Café Virtuoso and pastry purveyor Bread & Cie representatives also were on site, and doled out around 350 coffee samples and a variety of pastries for guests to try. About 1,000 Audrey’s-branded cookies also were passed out. After the daisy cutting, guests noshed on the delicious “A” is for Audrey butter cookies baked for the occasion by Bread & Cie, while the Teeny Tiny Pit Orchestra played Seussian tunes and other assorted melodies. Guests also scored “daisy tokens” for free coffee drinks by signing up to follow and like Audrey’s, which generated more than 350 new connections for the café across its social media channels, including Twitter, Facebook, and Instagram. More than 200 guests penned heartfelt notes of thanks to Audrey Geisel on brightly colored daisy shaped cards. Another popular activity was striking a pose in the “photo booth,” with multiple props on hand to ramp up the fun quotient, including daisies, frames, hats, and other eye-catching accessories. It didn’t take long for Amber Gallant, a third-year Revelle student studying cognitive science and world literature, to figure out what she liked most about Audrey’s. Gallant, who is one of the 200 students currently employed by the library, also said she would love to see a piece of collaborative or student art or writing on the walls of the café at some point. Ricardo Pinto Filho, currently a third-year international studies student at Eleanor Roosevelt College, said he is already smitten with Audrey’s hot cocoa and their Morrocan mint tea. Others also said they appreciated the fact that the library and the operator made a major commitment to sustainability in both the construction materials selected for Audrey’s as well as in the operations. Also, the café was given high marks by many library staff as well as students for selecting a local indie roaster — Café Virtuoso — whose coffees and teas are certified organic, fair trade and ethically sourced. According to Sports Facilities, Audrey’s also is taking steps to minimize its waste stream and plans to begin composting its coffee grounds in the near future. The café, which provides seating for 50 to 75 patrons, will be open daily, from 7:30 a.m. to 10 p.m. from Monday to Thursday, with shorter hours over the weekend. The café will stay open until midnight during Finals Week and other high-volume study times. The café is the first of several upgrades planned for the university’s flagship building over the next several years, thanks to a $3 million gift made by Audrey Geisel in July 2015, which is the lead gift in the Geisel Library Revitalization Initiative, a major endeavor aimed at transforming and rejuvenating the interior public spaces of the Library to meet the evolving needs of students, faculty and other library users in an increasingly digital environment. In addition to the café, the Geisel Library Revitalization Initiative will include a wide range of new technology enhancements, as well as new furniture, carpeting, and finishes. While Audrey Geisel’s generous gift will support the revitalization of the main floor public spaces, additional funds are needed to support renovation efforts in the public spaces on the 1st and 8th floors of the building. For more information visit library.ucsd.edu/give or contact Julie Sully, director of development for the library, at jsully@ucsd.edu or (858) 822-4554. For more information about Audrey’s: http://library.ucsd.edu/spaces/audreys-cafe.